1Division of Intractable Diseases, Center for Biomedical Sciences, National Institute of Health and Korea Centers for Diseases Control and Prevention, Cheongju, Korea. 2Department of Biochemistry, College of Medicine, Chungbuk National University, Cheongju, Korea. Received: November 8, 2016; Revised: February 9, 2017; Accepted: February 9, 2017; Published online: March 27, 2017. Embryonic stem cells (ESCs) can be expanded infinitely in vitro and have the potential to differentiate into hematopoietic stem cells (HSCs); thus, they are considered a useful source of cells for HSC production. Although several technical in vitro methods for engineering HSCs from pluripotent stem cells have been developed, clinical application of HSCs engineered from pluripotent stem cells is restricted because of the possibility of xenogeneic contamination resulting from the use of murine materials. Human ESCs (CHA-hES15) were cultured on growth factor-reduced Matrigel-coated dishes in the mTeSR1 serum-free medium. When the cells were 70% confluent, we initiated HSC differentiation by three methods involving (1) knockout serum replacement (KSR), cytokines, TGFb1, EPO, and FLT3L; (2) KSR, cytokines, and bFGF; or (3) cytokines and bFGF. Among the three differentiation methods, the minimal number of cytokines without KSR resulted in the greatest production of HSCs. The optimized method resulted in a higher proportion of CD34+CD43+ hematopoietic progenitor cells (HPCs) and CD34+CD45+ HPCs compared to the other methods. In addition, the HSCs showed the potential to differentiate into multiple lineages of hematopoietic cells in vitro. In this study, we optimized a two-step, serum-free, animal protein-free, KSR-free, feeder-free, chemically defined monolayer culture method for generation of HSCs and hematopoietic stem and progenitor cells (HSPCs) from human ESCs. Embryonic stem cells (ESCs) are undifferentiated cells that have the potential to self-renew and to differentiate into multiple cell types . Therefore, ESCs are considered a useful source of cells for regenerative medicine, drug screening, developmental studies, drug toxicity testing, disease modeling, and clinical therapeutics . Hematopoietic stem cells (HSCs) can be engineered from mesodermal differentiated ESCs and may be used in immunotherapy and to treat diverse hematological diseases . Therefore, it is important to develop feeder-free and xeno-free culture methods for differentiation of hematopoietic stem and progenitor cells (HSPCs) into HSCs for clinical applications. Both xeno-dependent and xeno-free methods have been developed for differentiation into HSCs . First, an ESC and stromal cell (feeder cell) co-culture method was developed using calvaria of newborn op−/op mice . Several studies have shown that feeder cells can interact physically with ESCs, and this interaction activates hematopoietic differentiation, resulting in the production of CD34+CD45+ human HSCs and progenitor cells . Second, a method for formation of ESC-derived embryoid bodies (EBs) was established. EBs are three-dimensional (3D) cell aggregates in suspension culture that mimic spatial organization of an embryo . Single-cell suspensions of EBs in a methylcellulose culture medium with hematopoietic cytokines efficiently induce hematopoietic differentiation of human ESCs . Third, a direct differentiation method in an extracellular-matrix-coated dish was developed. Collagens and fibronectins have been used as coating materials for monolayer culture to differentiate ESCs and induce pluripotent stem cells (iPSCs) into three germ layers . The resulting mesoderm in the matrix-coated dish can be further differentiated into HSCs in the presence of appropriate cytokines . Although these methods yield functional HSCs, some limitations including byproducts from murine feeder cells, long culture period for EB formation, and animal-derived culture substances like bovine serum and knockout serum replacement (KSR), should be overcome for clinical application of these methods . Therefore, the purpose of this study is to develop a clinically more relevant method for differentiation into HSCs with shorter culture periods and less cytokines. The use of human ESCs in this research was approved by the institutional review board (IRB) of Korea Center for Disease Prevention (2015-03-EPX-04-3C-A). ESCs (CHA-hES15) were cultured on mitomycin C (Sigma-Aldrich, Saint Louis, MO, USA)-treated STO cells (CRL-1503, ATCC) at 37℃, in an atmosphere containing 5% of CO2. Cultivation was conducted in Dulbecco's modified Eagle's medium (DMEM)/F12 medium containing 20% of KSR, 1% of nonessential amino acids, 0.1 mM β-mercaptoethanol, and 4 ng/mL β fibroblast growth factor (βFGF; Sigma-Aldrich). Upon reaching 70–80% confluence, the cells were passaged enzymatically using dispase (Thermo Fisher Scientific, Waltham, MA, USA) solution or detached manually using a 1,000 µL micropipette. Cell clumps were transferred to a cell culture dish coated with growth factor-reduced Matrigel (BD Biosciences, Billerica, MA, USA) and containing the mTeSR1 serum-free medium (STEMCELL Technologies, Vancouver, BC, Canada). The mTeSR1 medium was changed daily. As shown in Fig. 1A, the mTeSR1 medium was switched to those for step 1 (one of the three methods) with supplements on day 4 and once more switched to those for step 2 on days 8 and 11. The supplements in the step 2 medium included 100 ng/mL stem cell factor (SCF; Humanzyme, Chicago, IL, USA), 20 ng/mL FMS-like tyrosine kinase 3 ligand (FLT3L; Humanzyme), 4 ng/mL interleukin (IL)-3 (Humanzyme), 10 ng/mL IL-6 (Peprotech, Rocky Hill, NJ, USA), 40 ng/mL insulin-like growth factor-1 (Peprotech), and 10−6 M dexamethasone (Sigma-Aldrich). To dissociate differentiated cells, these cells were treated with Accutase (STEMCELL Technologies) for 10 min at 37℃ and were passed through 70-µm cell strainers (BD Biosciences) using pipette. Collected floating and adherent cells were reacted with an anti-CD34 antibody. CD34+ cells were isolated and sorted using MACS Magnetic Bead Columns (Miltenyi Biotec, Bergisch Gladbach, Germany) and CD34 Micro Bead Kit (Miltenyi Biotec), respectively. CD34+ hematopoietic cells were cultured in six-well plates containing 2 mL of MethoCult-H4435 semisolid medium (STEMCELL Technologies) per well as described previously . Hematopoietic colonies were counted after 14 days of incubation, photographed using an inverted microscope, and harvested for flow cytometric analysis. The cells were resuspended in phosphate-buffered saline (PBS) supplemented with 1% of bovine serum albumin (BSA) and analyzed by flow cytometry for the presence of cells of lymphoid and myeloid lineages. Adherent and floating cells were collected and filtered through a 70-µm cell strainer (BD Biosciences). The cells were then washed twice with FACS buffer (PBS, 10 mM EDTA, and 2% of fetal bovine serum) and resuspended in Dulbecco's PBS at up to 5×106 cells per 100 µL. The cells were stained with a fluorescein isothiocyanate (FITC)-conjugated anti-CD43 antibody, phycoerythrin (PE)-conjugated anti-CD45, peridinin chlorophyll protein (PerCP)-conjugated anti-CD34, and FITC-conjugated anti-KDR antibodies (BD Biosciences) for 30 min on ice, washed, and resuspended in staining buffer. The samples were analyzed using a FACSVerse flow cytometer (BD Biosciences) with the CellQuest v3.3 software (BD Biosciences). Data were collected and analyzed in the Flowjo software (Flowjo, LLC, Ashland, OR, USA). RNA samples were prepared using silica gel membrane-based spin-columns. All the procedures were performed according to the manufacturers' instructions. A total of 1 µg of RNA was used to generate first-strand cDNA using the RNA-to-cDNA EcoDry Premix (Clontech, Mountain View, CA, USA), and cDNA was amplified by polymerase chain reaction (PCR) using the Emerald Amp GT PCR Master Mix (Clontech). Amplification reactions were run using an ABI 7500 Real-Time PCR machine (Applied Biosystems, Foster City, CA, USA). Gene expression levels were normalized to that of GAPDH and analyzed as fold changes relative to the expression level of undifferentiated human ESCs. qPCR was run on an ABI Prism 7900HT Sequence Detection System (Applied Biosystems). A total of 2×104 colony-forming units (CFUs) were centrifuged to facilitate their attachment to glass slides using a Shandon Cytospin 4 Cytocentrifuge (Thermo Fisher Scientific) at 500 rpm for 5 min. The slides were analyzed by microscopy after staining with the Differential Quick Staining Kit (Polysciences, Warrington, PA, USA). All data are shown as mean±standard deviation, and comparisons between groups were performed using two-tailed Student's t tests. The level of significance was set to P≤0.05. We aimed to develop a method for generation of human HSCs and HSPCs that required fewer cytokines under serum-free and animal stromal cell-free monolayer culture conditions. To this end, we mimicked the process of d evelopment of human ESCs into hematopoietic cells in two steps. The first step (step 1) mimics initial differentiation into the hematopoietic mesoderm, and the second step (step 2) mimics commitment to HSPCs. Our goal was to generate HSCs capable of differentiating into multiple lineages of blood cells by optimized and clinically applicable culture conditions. In step 1, formation of EBs was waived by using an extracellular matrix that contained collagen IV. To optimize the conditions for generation of the hematopoietic mesoderm in a 2D matrix culture system, three methods were tested (Fig. 1A). Method 1 is a previously reported procedure that includes commonly used cytokine cocktails for HSC generation with KSR . In method 2, PGE2, TGF-β, EPO, and FLT3L were replaced with bFGF from method 1 to test whether replacement of several cytokines with one cytokine is sufficient to generate mesodermal cells. In method 3, KSR was removed from method 2 to determine whether HSCs could be generated without KSR, which contains chemically undefined materials and animal substances. The step 2 involved expansion of HSPCs and HSCs from mesodermal hemangioblasts by adding SCF, FLT3L, IL-3, IL-6, G-CSF, and Sonic hedgehog to the medium . Overall, three methods for differentiation into HSCs were evaluated in this study. Of those methods, method 3 is a chemically defined, serum-free, KSR-free, monolayer culture method that is more suitable for clinical applications than the other two methods are. We evaluated the progress of HSC formation by measuring the expression of pluripotency and mesodermal markers on days 4 and 7. All three methods resulted in downregulation of the pluripotent stem cell marker (Oct4) in a time-dependent manner (Fig. 1B). Removal of KSR (method 3) induced greater decrease in Oct4 and increase in mesodermal marker (Brachyury) compared with the other methods on days 4 and 7 (Fig. 1B, C). Moreover, method 3 induced Wnt3A gene expression at the highest magnitude on day 4 (Fig. 1D); this upregulation is an important signal for induction of the mesoderm formation by synergistic effect with BMP4 . Next, we examined Oct4 and Brachyury protein expression levels by immunocytochemistry on day 4. Oct4 expression was decreased and Brachyury expression was increased after step 1 culture in all three methods (Fig. 1E). Similarly to the mRNA expression pattern, the method 3 resulted in the lowest Oct4 protein level and the highest Brachyury protein level. After 4 days of initial differentiation, the medium was replaced to induce the next stage of hematopoiesis. The step 2 method involved addition of SCF, FLT3L, IL-3, IL-6, and G-CSF, without KSR. To determine whether the different methods in step 1 also affected commitment to HSPCs in step 2, we quantified pluripotency markers (Oct4 and Nanog) and early and late hematopoietic mesodermal markers on days 8 and 11. In both methods 1 and 2, mRNA levels of Oct4 and Nanog gradually decreased from day 8 to day 11 and neither of those were expressed on days 8 and 11 in method 3 (Fig. 2A, B). In addition, method 3 induced earlier expression of Brachyury than the other methods (Fig. 2C). Hematopoietic progenitor cells (HPCs) and HSCs derived from pluripotent cells express the late mesodermal and hematopoietic stem cell marker KDR (VEGFR2) . To determine whether KSR-free culture conditions (method 3) in step 1 resulted in greater expression of KDR, we evaluated the proportion and intensity of KDR expression on day 4. In agreement with the expression levels of mesodermal markers, method 3 resulted in a higher number of KDR+ cells, compared to the other two methods (Fig. 2D, E). The mean fluorescence intensity (MFI) was also higher in method 3 than those of the other methods (data not shown). In addition, expression of the primitive hematopoietic cell proliferation marker (Hoxb4) was greater for method 3 on day 8 (Fig. 2F). Next, we measured the proportion of CD34+CD43− hemogenic endothelial cells on days 8 and 11. Compared to the other two methods, method 3 yielded 5- to 6-fold higher proportion of CD34+CD43− cells on day 8 (Fig. 3A, B). In addition, method 3 resulted in a 6- to 12-fold higher proportion of CD34+CD43+ HPCs than the other two methods on day 11 (Fig. 3C). Furthermore, method 3 yielded 3-fold higher proportion of CD34+CD45+ HPCs on day 11 compared to the other two methods (Fig. 3D). An important function of HSCs is differentiation into multiple lineages of mature cells. To determine whether HSCs generated by method 3 have the differentiation potential into multilineage, we carried out colony formation assays . Each CD34+ cells of all three methods sorted on day 11 and differentiated into various colonies (Fig. 4A). 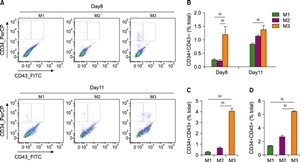 In line with the earlier finding that they showed enhanced induction of mesoderm formation, CD34+ cells of method 3 formed larger number of colonies than those of the other two methods after 12 days of culturing in Methocult media (Fig. 4B). In addition, fully differentiated cells―such as basophils, monocytes, neutrophils, erythrocytes, and lymphocytes― were identified by Wright-Giemsa staining (Fig. 4C). Production of functional, robust, and clinically transplantable HSCs from pluripotent cells is challenging. In this study, we propose an optimized method for generation of HSCs from human ESCs under animal product-free, undefined-component-free conditions. Salvagiotto et al. used a two-step, feeder-free and serum-free protocol to differentiate ESCs into human blood cells. Although that method can shorten the culture period and reduce the steps for the engineering of HSCs, the uses of bFGF from zebrafish and BSA limit its clinical application. Another novel serum-free monolayer culture system that involves a 16-d three-step culture protocol with a simple cytokine combination in a matrix-coated dish was developed by Niwa and colleagues . However, basal medium Stemline II contains human albumin and KSR; the latter contains BSA and may limit clinical applications. In comparison, the method 3 in our study is simplified and fully defined xeno-free and KSR-free. We believe that this method will facilitate clinical applications of HSCs when further optimized for HSC production on a larger scale. Furthermore, we found that removal of KSR from the 2D matrix culture system enhanced the differentiation of ESCs into mesodermal cells and CD34+CD45+ HSCs. KSR contains some antioxidants like vitamin C and high concentration of vitamin C can decrease expression of Brachyury and increase expression of Oct4 . 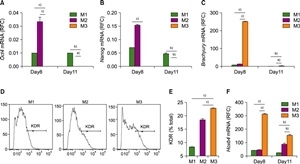 Therefore, it is possible that vitamin C in KSR may interfere with the mesodermal differentiation of ESCs, and consequently, elimination of KSR in method 3 resulted in higher efficiency of differentiation into HSCs. The process of hematopoietic development is tightly regulated by waves of cytokines. The key cytokines in directed mesodermal differentiation are BMP4, FGF2, and activin A; in conversion differentiation, the key factors are BMP4, SCF, FLT3L, IL-6, IL-3, and G-CSF. Our findings suggest that bFGF is a key factor of mesodermal differentiation. Replacement of PGE2, TGFβ1, EPO, and FLT3L with bFGF resulted in enhanced induction of Brachyury expression, formation of KDR+ cells, and prolonged generation of CD34+ CD45+ HSCs. In conclusion, our findings show that method 3, which involves reduced amounts of cytokines without KSR, is an optimized two-step, serum-free, animal substance-free, KSR-free, feeder-free, chemically defined monolayer culture method for generation of functional HSCs and HSPCs from human ESCs. (A) Schematic representation of the optimized differentiation protocol used to generate hematopoietic precursors and progenitors from ESCs. (B–D) Relative expression of Oct4, Brachyury, and Wnt3a, respectively on days 4 and 7. (E) Immunostaining for Oct4, Brachyury, and DAPI (4',6-diamidino-2-phenylindole) during initial differentiation of colonies on days 4 and 7. a)P <0.05, b)P <0.01. (A–C) Relative expression levels of Oct4, Nanog, and Brachyury, respectively on days 8 and 11. (D, E) Flow cytometric analysis of KDR+ cells after 4 days of differentiation (D) Histogram images of the KDR flow cytometry data. (E) The percentage of KDR+ cells in the total cell population. (F) Relative expression of Hoxb4 toward that in undifferentiated ESCs. a)P <0.05, b)P <0.01, c)P <0.001. HSC and progenitor cell populations among differentiated cells. (A) Dot blot images of flow cytometric analysis. Upper and lower panels show differentiated cells on days 8 and 11, respectively. (B) The proportion of CD34+CD43− cells on days 8 and 11. (C) The proportion of CD34+CD43+ cells in the total cell population on day 11. (D) The proportion of CD34+CD45+ cells on day 11. a)P <0.05, b)P <0.001. 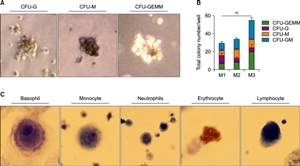 (A) Colony-forming units of macrophages (CFU-M), granulocytes (CFU-G), and granulocytes, erythroid macrophages, and megakaryocytes (CFU-GEMM) after 14 days of CD34+ cell culture in Methocult. (B) The number of colonies of each type in a 35-mm dish, counted manually. (C) Fully differentiated cells of multiple lineages. (Wright-Giemsa stain, ×1,000) a)P <0.05. Thomson, JA, Itskovitz-Eldor, J, Shapiro, SS, et al. Embryonic stem cell lines derived from human blastocysts. Science, 1998;282;1145-1147. Odorico, JS, Kaufman, DS, Thomson, JA. Multilineage differentiation from human embryonic stem cell lines. Stem Cells, 2001;19;193-204. Murry, CE, Keller, G. Differentiation of embryonic stem cells to clinically relevant populations: lessons from embryonic development. Cell, 2008;132;661-680. Avior, Y, Sagi, I, Benvenisty, N. Pluripotent stem cells in disease modelling and drug discovery. Nat Rev Mol Cell Biol, 2016;17;170-182. Grskovic, M, Javaherian, A, Strulovici, B, Daley, GQ. Induced pluripotent stem cells--opportunities for disease modelling and drug discovery. Nat Rev Drug Discov, 2011;10;915-929. Slukvin, II. Hematopoietic specification from human pluripotent stem cells: current advances and challenges toward de novo generation of hematopoietic stem cells. Blood, 2013;122;4035-4046. Suzuki, N, Yamazaki, S, Yamaguchi, T, et al. Generation of engraftable hematopoietic stem cells from induced pluripotent stem cells by way of teratoma formation. Mol Ther, 2013;21;1424-1431. Amabile, G, Welner, RS, Nombela-Arrieta, C, et al. In vivo generation of transplantable human hematopoietic cells from induced pluripotent stem cells. Blood, 2013;121;1255-1264. Choi, KD, Vodyanik, M, Slukvin, II. Hematopoietic differentiation and production of mature myeloid cells from human pluripotent stem cells. Nat Protoc, 2011;6;296-313. Ledran, MH, Krassowska, A, Armstrong, L, et al. 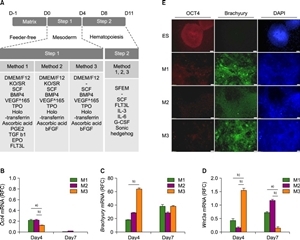 Efficient hematopoietic differentiation of human embryonic stem cells on stromal cells derived from hematopoietic niches. Cell Stem Cell, 2008;3;85-98. Pang, S, Wu, Q, Tian, S, et al. Establishment of a highly efficient hematopoietic differentiation model from human embryonic stem cells for functional screening. Sci China Life Sci, 2013;56;1147-1149. Lee, KY, Fong, BS, Tsang, KS, et al. Fetal stromal niches enhance human embryonic stem cell-derived hematopoietic differentiation and globin switch. Stem Cells Dev, 2011;20;31-38. Vodyanik, MA, Bork, JA, Thomson, JA, Slukvin, II. Human embryonic stem cell-derived CD34+ cells: efficient production in the coculture with OP9 stromal cells and analysis of lymphohematopoietic potential. Blood, 2005;105;617-626. Vodyanik, MA, Thomson, JA, Slukvin, II. Leukosialin (CD43) defines hematopoietic progenitors in human embryonic stem cell differentiation cultures. Blood, 2006;108;2095-2105. Aoyama, K, Oritani, K, Yokota, T, et al. Stromal cell CD9 regulates differentiation of hematopoietic stem/progenitor cells. Blood, 1999;93;2586-2594. Wang, J, Zhao, HP, Lin, G, et al. In vitro hematopoietic differentiation of human embryonic stem cells induced by co-culture with human bone marrow stromal cells and low dose cytokines. Cell Biol Int, 2005;29;654-661. Lim, WF, Inoue-Yokoo, T, Tan, KS, Lai, MI, Sugiyama, D. Hematopoietic cell differentiation from embryonic and induced pluripotent stem cells. Stem Cell Res Ther, 2013;4;71. Grigoriadis, AE, Kennedy, M, Bozec, A, et al. Directed differentiation of hematopoietic precursors and functional osteoclasts from human ES and iPS cells. Blood, 2010;115;2769-2776. Salvagiotto, G, Burton, S, Daigh, CA, Rajesh, D, Slukvin, II, Seay, NJ. A defined, feeder-free, serum-free system to generate in vitro hematopoietic progenitors and differentiated blood cells from hESCs and hiPSCs. PLoS One, 2011;6;e17829. Niwa, A, Heike, T, Umeda, K, et al. A novel serum-free monolayer culture for orderly hematopoietic differentiation of human pluripotent cells via mesodermal progenitors. PLoS One, 2011;6;e22261. Lynch, MR, Gasson, JC, Paz, H. Modified ES / OP9 co-culture protocol provides enhanced characterization of hematopoietic progeny. J Vis Exp, 2011;;pii:2559. Woods, NB, Parker, AS, Moraghebi, R, et al. Brief report: efficient generation of hematopoietic precursors and progenitors from human pluripotent stem cell lines. Stem Cells, 2011;29;1158-1164. Bhardwaj, G, Murdoch, B, Wu, D, et al. Sonic hedgehog induces the proliferation of primitive human hematopoietic cells via BMP regulation. Nat Immunol, 2001;2;172-180. Dahlberg, A, Delaney, C, Bernstein, ID. Ex vivo expansion of human hematopoietic stem and progenitor cells. Blood, 2011;117;6083-6090. Biancotti, JC, Town, T. Increasing hematopoietic stem cell yield to develop mice with human immune systems. Biomed Res Int, 2013;2013;740892. Gertow, K, Hirst, CE, Yu, QC, et al. WNT3A promotes hematopoietic or mesenchymal differentiation from hESCs depending on the time of exposure. Stem Cell Reports, 2013;1;53-65. Ziegler, BL, Valtieri, M, Porada, GA, et al. KDR receptor: a key marker defining hematopoietic stem cells. Science, 1999;285;1553-1558. Lian, X, Bao, X, Al-Ahmad, A, et al. Efficient differentiation of human pluripotent stem cells to endothelial progenitors via small-molecule activation of WNT signaling. Stem Cell Reports, 2014;3;804-816. Sarma, NJ, Takeda, A, Yaseen, NR. Colony forming cell (CFC) assay for human hematopoietic cells. J Vis Exp, 2010;;-pii:2195. Ji, AR, Ku, SY, Cho, MS, et al. Reactive oxygen species enhance differentiation of human embryonic stem cells into mesendodermal lineage. Exp Mol Med, 2010;42;175-186.